Whether you need extra parking, storage or a craft and hobby space, you’ll find it with this traditional style, 2-car garage plan. Simple design elements lend stylish curb appeal including a siding and brick façade and reverse gable roofline, allowing this detached garage to blend nicely with a variety of architectural home styles. The open double bay offers 623 square feet of usable space ideal for parking the cars or other motorized vehicles like a golf cart, ATV or any other large items you wish to store. Furthermore, the open space can easily serve as a workshop with plenty of room along the wall to add a workbench and storage cabinets for tools and supplies. 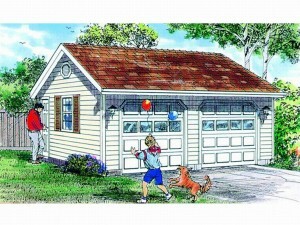 An overhead garage door and side-entry service door allow easy access inside. 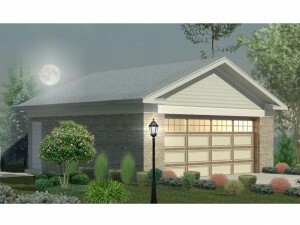 Add functionality and practical storage space to your home with this detached 2-car garage plan. View this plan for more details. Sometimes it is the simple things in life that make us happiest. That just might be the case for you when it comes to 2-car garage plans. Perhaps all you want is a double garage to protect your cars from the elements or vandals. Maybe you don’t need all the special features and decorative frills that enhance some garage floor plans. If simple is what you need or want, we have simple 2-car garages to satisfy your needs. These basic structures offer an unfussy façade, a basic roofline, a simple footprint and either one or two overhead garage doors. Some may provide a service door for easy entry and exit and perhaps a couple of windows. Take some time browsing our collection of 2-car garage plans, there are plenty of simple designs to choose from like plan 033G-0013.